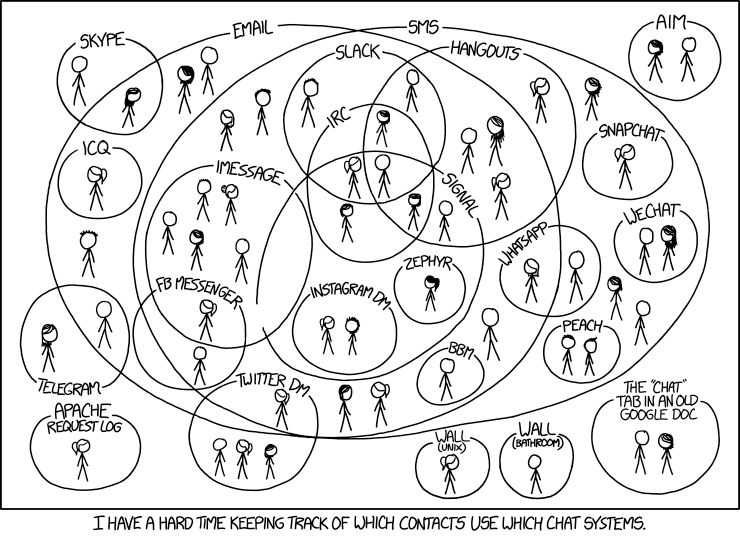 This graphic from xkcd is brilliant (as is always the case). That’s certainly not all of them; those are just the ones that pop into my mind right now. It’s incredibly overwhelming, so it’s no surprise things end up slipping between the cracks. For me, my Facebook page’s messages are extremely neglected, and when I do remember to check those messages, I see important questions about my book or asking me for info about a workshop. Obviously this is frustrating, and I’m not the only one. My wife’s jewelry business gets messages across a ton of different channels, and things like Instagram messages that contain business inquiries end up slipping between the cracks. Managing all these messages across doesn’t have to be hard. I was just suggesting that every app should have the ability to cross-post messages (or at least provide notifications) to email. *Every app* that has a messaging feature should have the option to forward messages (or at least send notification of message) to email. From a business standpoint, it’s not hurting any app to provide notifications in other channels. I actually check LinkedIn messages because I get an email when I receive one. In fact, that’s really the only time I find myself on LinkedIn. So providing that notification alert is good for their business. In an ideal world, it would be great if everyone could funnel all messages across channels into their preferred messaging medium of choice, and manage it all from there. Until then, we’re all stuck in messaging hell.